The International MRI Course in SpA is available in English, Spanish, Chinese (Mandarin), and Portuguese. Click the image below to access. El curso internacional de RMN en EspA se encuentra disponible en Inglés, Español, Chino Mandarín y Portugués. Haga clic en la imagen de abajo para acceder al mismo. O Curso Internacional de RNM em EpA está disponível em Inglês, Espanhol, Chinês (Mandarim) e Português. Clique na imagem abaixo para acessar. 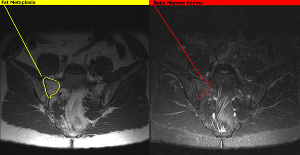 Click the image above to view a video about our International MRI Workshop in SpA produced by the Spondylitis Association of America (SAA). An Academic Research Organization providing support for research and education into arthritis and focused on the growing field of personalized medicine. The people of CaRE Arthritis have special expertise in the development and application of medical imaging and biomarkers to research and education. A soluble biomarker is a term used to refer to a protein or other substance that can be measured in bodily fluid, such as blood or urine, and whose concentration reflects the presence and/or severity of some disease state. An imaging biomarker such as Magnetic Resonance Imaging (MRI) may also reflect the presence and/or severity of disease. Thus, in arthritis, biomarkers may indicate who will develop severe disease, who is most likely to respond to particular drugs, and why some patients do better than others. In addition, CaRE provides education for medical professionals involving all the latest advances in the field. This includes highly interactive programs, workshops, and online tools that promote self-learning. The development and application of new imaging and biomarker technologies is an essential step towards bringing the concept of personalized medicine to the reality of day-to-day management of patients with arthritis.